and widely used in software engineering for building reusable components using OO modeling) may also fit the requirements of Pragmatic Web? Thanks for additional details if possible. Dear Irina. Yes, design patterns are very important elements of the Pragmatic Web, as also pointed out in my paper. However, the design patterns you refer to, are closer to technical patterns. The real challenge for the PW is to focus more on developing the higher-level, _socio_-technical design patterns. These patterns take into account fuzzier aspects, like community and individual goals, social norms etc. 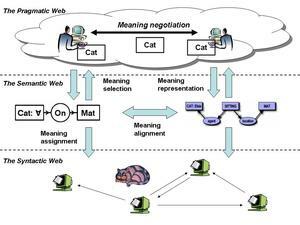 before I begin, I thank you ,I want examples of the individual ontologies of contexts and ontologies for semantic web ,because i want simulate the negotiation of meaning.